Stewart, J.d.m.. "Dino Ciccarelli". The Canadian Encyclopedia, 02 December 2014, Historica Canada. 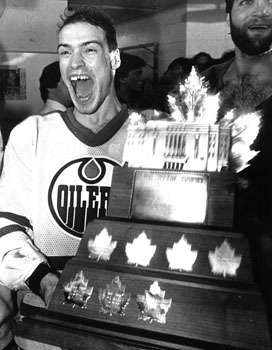 https://www.thecanadianencyclopedia.ca/en/article/dino-ciccarelli. Accessed 18 April 2019. Dino Ciccarelli, hockey player (b at Sarnia, Ont 8 Feb 1960). At 5'10" and 180 lbs, Dino Ciccarelli was considered too small to be successful in the NATIONAL HOCKEY LEAGUE. Dino Ciccarelli, hockey player (b at Sarnia, Ont 8 Feb 1960). At 5'10" and 180 lbs, Dino Ciccarelli was considered too small to be successful in the NATIONAL HOCKEY LEAGUE. He had also broken his leg as a teenager, so despite a highly successful junior hockey career with the London Knights (1976-1980) of the Ontario Hockey League, Ciccarelli was never drafted to the NHL. Instead Ciccarelli was signed as a free agent in 1979 by the Minnesota North Stars. He made his NHL debut in the 1980-1981 season during which he was remembered most for his dynamic play in the playoffs, scoring 14 goals as a rookie and helping lead the North Stars to the STANLEY CUP finals. The following season, his first full season in the NHL, Dino Ciccarelli scored 55 goals. 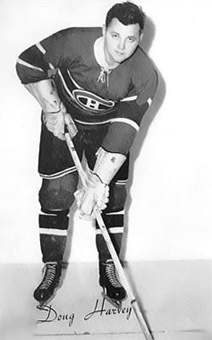 Ciccarelli became known for scoring so-called "garbage goals" - pucks slammed into the net from the edge of the crease. He took a physical beating in front of the net, but he was so successful at this that he ended up with 608 career goals and 1200 points during his 19-year career. Ciccarelli spent 9 seasons with Minnesota before being traded to the Washington Capitals in 1989. In 1992 he was traded to the Detroit Red Wings where he again made it to the Stanley Cup finals in the 1994-1995 season. Ciccarelli played one and a half seasons with the Tampa Bay Lightning and a further season and a half with the Florida Panthers before age and injuries forced him into retirement after the 1998-1999 season. In 2010, Dino Ciccarelli was inducted into the HOCKEY HALL OF FAME.